SPRUCE CREEK, FL - The Spruce Creek Fly-In was featured in this month's issue of FLYING magazine in their special section: 2010 Fly-in Community Guide, sponsored in part by Spruce Creek's own Karlhaus Realty. 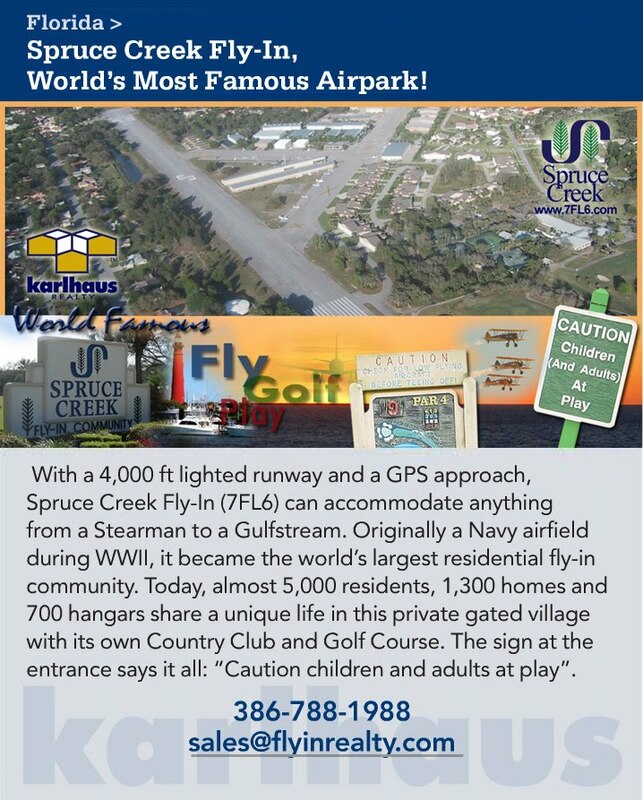 Karlhaus Special advertising sponsorship exposes their Spruce Creek Fly-In properties to FLYING Magazine's 1.3 million readers worldwide. The FLYING reader is active, affluent, and an adventurist by nature. "This is exactly the target audience for our properties, especially high-end Hangar Homes and Golf Course Homes", said Karlhaus CEO and Managing Broker, Carlos Bravo. The Karlhaus advertising program also includes exposure in the online FLYING Marketplace section. FLYING Magazine has been Aviation’s premier magazine for 82 years ever since its first issue in 1927. The Monthly magazine is written for and read by the pilots who actively use general aviation for both personal and business travel. Since its inception, FLYING has been the voice of aviation, read by current and would-be pilots who value the authoritative judgments and engaging first-hand experience of the most qualified editorial staff in aviation. It is the inspiration for people who are passionate about aviation and a valued resource for the segment of licensed pilots who actively fly. FLYING readers are active passionate pilots who incorporate aviation into their personal and business lives. FLYING is read by over 72% of the pilots who have purposefully flown for personal and business reasons in the last 12 months. and 70% of pilots owning aircraft valued at between $100,000 and 500,000.